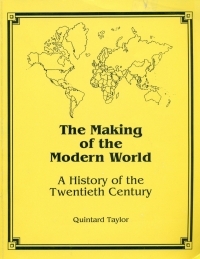 THE MAKING OF THE MODERN WORLD: A Reader in 20th Century Global History | Dr. Quintard Taylor, Jr. This reader in modern world history attempts to put in perspective the major events of the 20th century which have had a global impact. That century began with the promise of war permanently banished, of medical advances that would extend life and enhance its quality, where industrialization would finally eliminate material deprivation and the expansion of knowledge would permanently end our spiritual poverty. The world has not reached that new millennium. Some grand predictions became a reality but much of the progress automatically assumed and the century's onset was lost in the spiraling carnage of war and hatred unleashed for the first time on a global scale in 1914. If our failure to achieve the beneficent transformation lies in our past then The Making of the Modern World is an attempt to try to understand that past. Thus words of the variety of people in this volume ranging from Adolf Hitler and Mao Zedong to Tsuki-san, the teenage factory girl in pre-World War II Japan and the anonymous Kenyan businesswoman in the 1970s all help us comprehend the diverse views and values which have shaped our planet. Through their words we may find a more profound understanding of our past and possibly our future. Quintard Taylor is Scott and Dorothy Bullitt Professor of American History at the University of Washington, Seattle. He is the author of In Search of the Racial Frontier: African Americans in the American West: 1528-1990 and The Forging of a Black Community: Seattle's Central District from 1870 through the Civil Rights Era. Taylor is also the website director of the award-winning portal www.blackpast.org. This 3,000 page website is the largest free and ungated reference center on African American history on the Internet. BlackPast.org is dedicated to providing reference materials to the general public on African American history in the United States and on the history of people of African ancestry around the world.